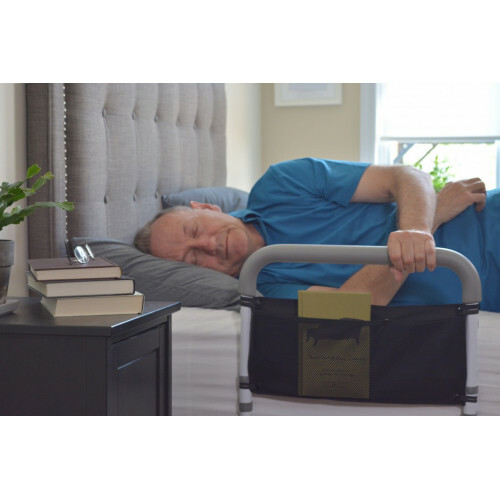 The Assista-Rail provides secure in-bed support, perfect for anyone requiring assistance to move and lift themselves out of bed. The Assista Rail slides between the boxspring and mattress, and secures in place with a safety strap. The Assista Rail is height adjustable to accommodate various mattress thicknesses. Multiple cross bars provide safe handle placements for in bed movements. The Assista-Rail also features a convenient bed organizer that keeps your belongings in reach, right beside you. Bed rail fits between box spring and mattress; secures to angle iron bed frame with safety strap.